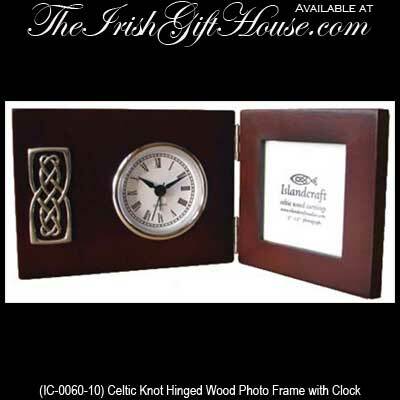 This Irish desk photo frame and clock combination features a pewter Celtic knot design. This Irish desk accessory features wooden picture frame and battery operated clock combination that is enhanced with Celtic knot-work. The Celtic picture frame, when unhinged, measures 10" wide x 4" tall and it holds a 3" wide x 3" tall photo.